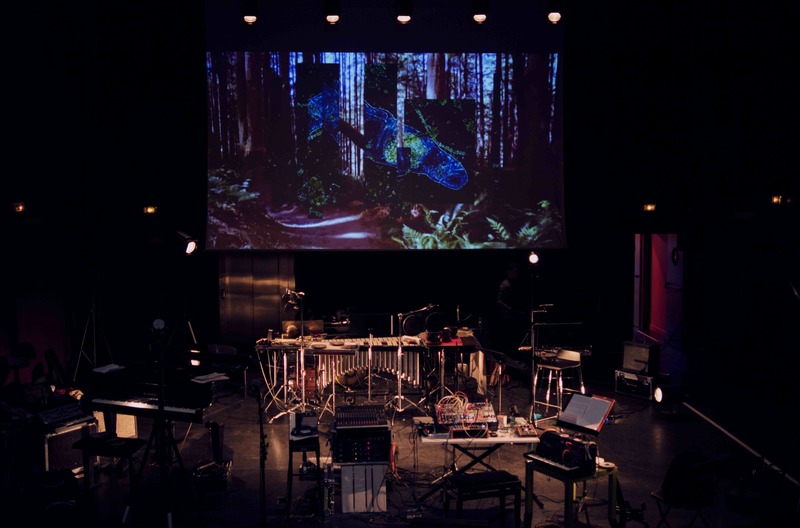 Printemps (Spring), between artistic installation and live performance, is undoubtedly more than a concert. It is built like an experiment, an initiation ritual. With its singular intersection of space and place, the central disposition of the instruments, the minimal thought decisive interplay of light and darkness, the use of video, the circumambulations performed by Aalam Wassef and Julien Boudart shaking the concentration of Sylvaine Hélary, Antonin Rayon and Sylvain Lemêtre frantically chained to their instruments, the sudden emergence of text and dialogue and calculated accidents, all of this contributes to the dramatic process, inexorably. Printemps offers a rich and precise chamber music, venturing both into the demanding acoustic instruments and sound devices. Such sound profusion expands into space with a scenography integrating images and video extracts into the device suggesting open ending.